Most ladder deaths occur from falls that are 10 feet or less. The common causes of ladder deaths and injuries include incorrect ladder setup angle, setting ladder on uneven surface, not locking ladder spreaders in horizontal position, using the wrong ladder, insufficient ladder inspection, improper ladder use, leaning and overreaching, and lack of access to ladder safety tools, information and training. In some instance is it due to a defective product. Falls can occur in the home and in the workplace. There are many different jobs and scenarios where one may need to use a ladder - fixing roofs, cleaning gutters, reaching a top shelf, hanging holiday lights, or window cleaning. Construction workers and extraction (mining) occupations are at most risk followed by installation, maintenance and repair occupations. Falls have occurred as a result of the ladder user holding objects in one hand while trying to scale up or down the ladder; wearing inappropriate shoes; wearing wet, greasy or oily shoes; being inattentive and missing a step; losing their balance; leaning or overreaching causing the ladder to tip; losing their handgrip, losing ladder surface grip, or standing on the ladder above where indicated for safe ladder usage. Some people do not remember how they fell or they were too embarrassed to tell. While ladders can be useful tools, when used incorrectly, they can cause serious injuries including sprains, bruising, cuts, abrasions, fractures, broken bones, head injuries, concussions, spinal cord injuries, paralysis, electrocutions, and even death. 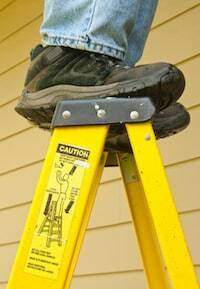 Injuries from ladder falls can be severe but are preventable. Common sense and basic safety practice go a long way to preventing ladder falls, injuries, and death. The Occupational Safety and Health Administration (OSHA) recommends that that ladder users follow the manufacturer's instructions and ladder labels, face the ladder while climbing up and down, keep slippery materials away from ladders, use a barricade to keep traffic away, only put ladders on a stable, level surface, maintain three points of contact (two hands and a foot, or two feet and a hand), and always check for and avoid, overhead powerlines. Additional resources and safety tips are below.